‘Planning is not a barrier to building’. This is the initial statement of a recent report from the Local Government Association that it is hoped will not only move the debate on implemented planning and slow build up rates for developments, but also illustrate how councils and developers can work in partnership to ensure the timely build out of high quality projects. 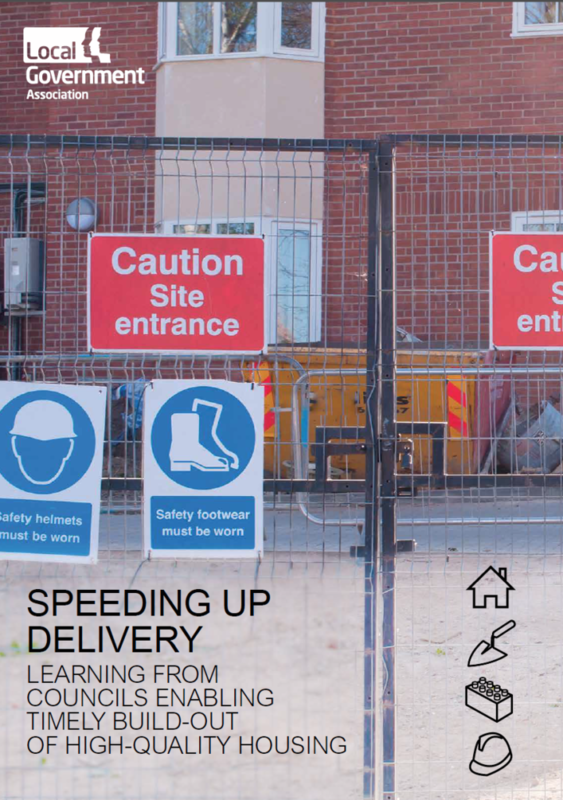 Speeding Up Delivery — Learning from Councils Enabling Timely Build out Of High Quality Housing, a report from the Local Government Association, states that while house building is a complex business and planning permission is not an isolated part of housing delivery, there is a need for local authorities and developers to talk to each other and understand what lies behind the issues, at the level of individual sites and national statistics. There is a need to work collaboratively to progress build out – to the point of considering ways to take or enforce action to speed-up delivery. It is also pointed out that more needs to be done to support, encourage and spread best practice in the private sector. • Smart use of planning conditions and design codes. • Using planning powers to unlock development through Section 106 legal agreements and enforcement measures. • Streamlining the planning process end to end. • Developing a culture and capacity to deliver. • Enabling and delivering housing. Theme one of the guide explores and gives examples of the smarter use of planning conditions. In its research for the guide, the LCA conducted interviews with developers and planning consultants. In the process, common issues were unearthed with planning conditions and impediments to build-out. Applicants highlighted that they have to deal with a large number of pre-commencement conditions before they can start to build, and standard conditions can be inflexible to the scheme. The partnership between the North-East Lincolnshire Council and ENGIE is presented as an example of ‘changing the language on conditions’. The council does not think just of ‘pre-commencement’ but perhaps ‘pre-the first brick being laid’. Changing the language allows essential site work to begin and development working faster. The council works with developers and, where appropriate, uses extension of time agreements so that complex issues can be resolved prior to decision. This does not work for all developers, and the partners recognise this, however, many developers are keen to work through essential conditions and get a decision on time. Another tool used by North-East Lincolnshire, which is still very under-used around the country, is the local development order (LDO). The council brought forward LDOs in Grimsby and Cleethorpes in March 2016. LDOs make the process of obtaining permission simpler and quicker by removing the need for the developer to make a planning application, through granting automatic planning permission for specified development in certain areas. The second theme of the guide points out that many local authorities are using their planning powers to speed up development or unlock stalled development — and not just through compulsory purchase orders (CPOs). Central Bedfordshire Council have started to use Section 106 legal agreements. Several years ago, the council was unable to demonstrate a five-year housing land supply. It took some legal advice and developed a ‘delivery clause’ in its Section 106 legal agreements. The clause states that if the developer claims that an application should receive permission because of the lack of a five-year supply, they should commit to deliver build-out of that site within five years of permission being granted (provided it could be demonstrated to be sustainable development). East Riding of Yorkshire Council is one of the councils across the country that has worked to make the planning process easier and quicker to navigate by enabling staff to increase efficiency, offering better staff training and communicating more with applicants. The council commissioned a retired planning inspector to look through a sample of committee reports and, on the back of his advice, amended the structure. After taking a plain English course, officers are now producing reports half the length that they would have been previously. Sunderland City Council has high ambitions: delivering homes on a need identified in the city’s draft local plan and a commitment to diversification of housing stock and provision of enough homes of the right type, in the right tenure. In 2016 the council looked at what it could do to build housing types the market is not fulfilling. Sunderland Homes Ltd is a council-owned company that is taking a hands-on approach to develop housing types that tend to not be built, such as larger family homes (housing of four or more bedrooms), bungalows, and small-scale schemes of 10 to 40 units. To finance its housing development Sunderland Homes obtained a loan at market rate from the authority’s capital programme for housing and operates on a commercial model. The company intends to reinvest profits in future schemes, which will also tackle 2,000 empty homes in Sunderland. The guide provides far ranging ideas and innovations for council planning, including case studies from councils across the country. These case studies featured through the five themes of the guide highlight different ways in which councils can act to ensure that future developments gain planning permission quickly, have quality-certainty by being aligned with a strong vision, and build out speedily thanks to clearer pre-commencement requirement conditions.